Sept. 8, 2017, 10:50 a.m. The percentage of people who get their news from TV is falling across all categories, Pew noted this week, as online news consumption increases. And the gap between online and TV news consumption is narrowing. 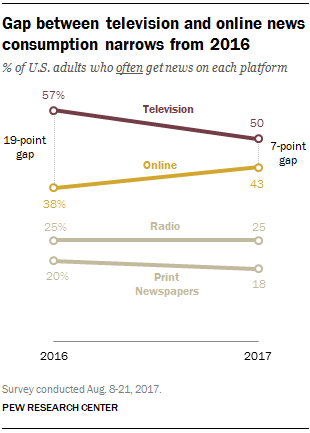 In early 2016, Pew found that 57 percent of Americans were “often” getting news on TV, while 38 percent were often getting news online — a 19-point gap. By August 2017, 50 percent of Americans were often getting news from TV and 43 percent were often getting it online — a seven-point gap. Meanwhile, the percentage of Americans who get news from radio and from print newspapers remained roughly flat. Pew asked about three kinds of TV news — local, network, and cable — and found that local TV news use declined the most. The shift is driven by older people — who are also increasingly using social media for news and getting news on mobile. The two oldest age groups saw considerable increases in online news use – 10 percentage points for those 65 and older (30 percent vs. 20 percent in early 2016) and 6 points among those ages 50 to 64 (35 percent vs. 29 percent). The pattern is in line with previous findings that show that recent growth in mobile news was driven by the oldest age groups. Pew had previously asked about TV news use in an election year; in 2016, cable TV news was ranked Americans’ “most helpful source” for learning about the election. Maybe people rely on TV news less in non-election years. Still, it seems like a safe bet that by 2020, more people will be learning about the election from online sources than from TV. Owen, Laura Hazard. "People are watching a lot less TV news (especially local TV) as they get more news online." Nieman Journalism Lab. Nieman Foundation for Journalism at Harvard, 8 Sep. 2017. Web. 25 Apr. 2019. Owen, Laura Hazard. "People are watching a lot less TV news (especially local TV) as they get more news online." Nieman Journalism Lab. Last modified September 8, 2017. Accessed April 25, 2019. https://www.niemanlab.org/2017/09/people-are-watching-a-lot-less-tv-news-especially-local-tv-as-they-get-more-news-online/.